Microfibre material in cleaning has been praised for its many benefits, which include, absorbing seven times their weight in water, removing 98.9 per cent of bacteria from smooth surfaces by just using water and drying in one-third the time of traditional cotton. Microfibre is a densely constructed polyester and polyamide (nylon) fibre that is approximately 1/16th the thickness of a human hair. When woven together, they create a net-like surface area covered with millions of spaces to trap moisture, dirt and debris. The use of microfibre can improve standards of hygiene while boasting impressive bacterial removal properties – all while using fewer chemicals than traditional cloths. The microfibre technology is now available for use in floorcare, to help halt the spread of dirt and bacteria. Busy spaces which experience a high footfall – such as waiting rooms, corridors and reception areas – can be problematic to clean, especially as many are in use for long periods. Often, floor-cleaning machinery is too large to use in such areas. While traditional string mops are easy to manoeuvre, they often deliver an inconsistent clean and a wet-mopped floor can take up to 10 minutes to dry fully, increasing the chances of an accidental slip or fall. What’s more, potentially dangerous bacteria can remain in the mop, even after washing, significantly increasing the risk of germs being spread onto the next surface to be cleaned. The Microfibre Mopping System from our supplier Chicopee enables cleaning professionals to deliver a consistent clean without the need for laundering – the mops are simply discarded after use. Made from 100 per cent splittable microfibre, the mops trap dust, dirt and germs within their fibres, eradicating the danger of spreading bacteria. 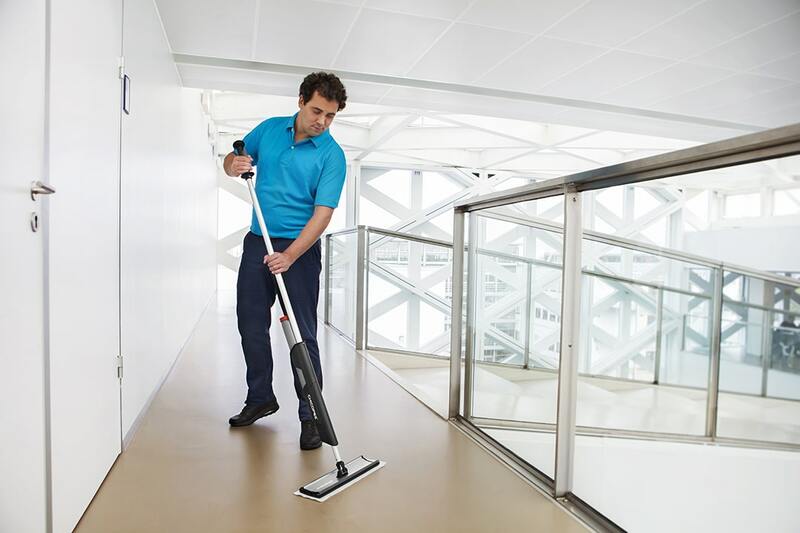 The mops are attached quickly and easily to the ergonomic, easy to use mopping tool. This has a built-in reservoir of cleaning fluid which is only dispensed when the user pulls a trigger to release it. In fact, it is possible to clean more than 75 square metres without either refilling the reservoir or changing the mop. The Microfibre Mopping System makes the task of cleaning floors easier, while delivering superior cleaning performance, improving hygiene standards, saving time and money. For more information on the Chicopee Microfibre Mopping system, please contact local Bunzl Catering Supplies today.